John Peña | Los Lobotomys - The Official Site | World renowned instrumental band, playing everything from hard rock to be-bop, with a strong focus on improvisation. 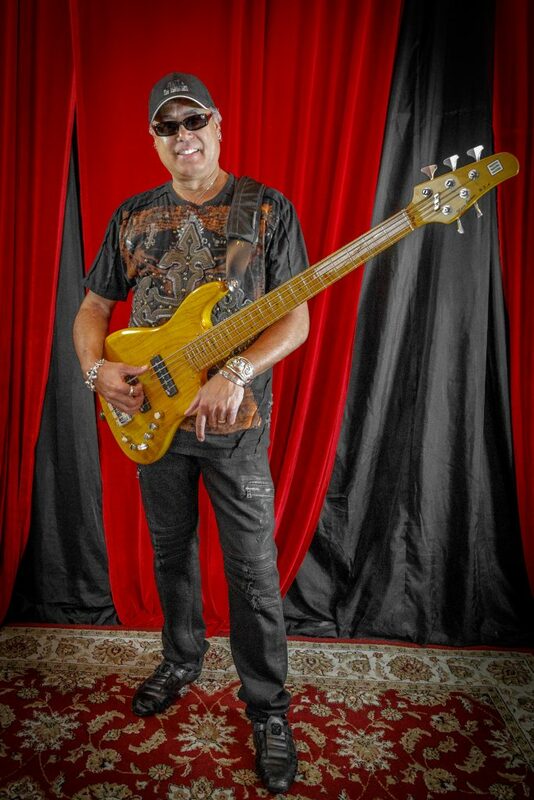 John Peña began his musical journey in New York at the age of 6, playing guitar under the guidance of his father, John Peña, Sr. By the time he was 17, John Jr. was residing in Puerto Rico and had become a much sought-after bassist, which jump-started his professional career. Peña is well versed in virtually all types of music, including rock, jazz, R&B, blues, latin, gospel and everything in between. He has performed and/or recorded with Tania Maria, Celia Cruz, Carlos Santana, Julio Iglesias, Sergio Mendez, Natalie Cole, The Crusaders, Herb Alpert, Chaka Khan, Take 6, Jerry Garcia, Chick Correa, Steve Vai, Diana Ross, Tolu, Aretha Franklin, Ricky Martin, Barry Manilow, Larry Carlton, Joe Sample, Dave Koz, Arturo Sandoval, Dionne Warwick, Katherine McPhee, Mickey Thomas (Jefferson Starship), John Cafferty, Glen Hughes (Deep Purple), Don Felder (Eagles), Alex Acuña & the Unknowns, Gordon Goodwin’s Big Phat Band, Ivan Lins, David Sanborn, Patti LaBelle, Vesta, Anne Nesby, Patti Austin, Kenny G, Tommy Walker, Kenny Loggins, Andrae Crouch, Yolanda Adams, Oleta Adams, Walter Hawkins, Thelma Houston, Dionne Warwick, Keiko Matsui, Nina Simone, Engelbert Humperdinck, Juan Gabriel, Laura Pausini, Luis Enrique, Ednita Nazario, Marco Antonio Solis, Eros Ramazzotti, Marisela and countless others. John’s TV and movie credits as a performer, composer, programmer and/or arranger include: Rush Hour, Along Came Polly, Men in Black, Proof of Life, Mo Money, Maximum Risk, Bringing Down the House, Original Sin, Access Hollywood, ET, Friends, Roundhouse, Oprah, Tyra Banks Show, Jerry Springer, Desperate House Wives to name a few. He has also received many nominations and awards for his work as a composer, arranger and performer, including the Latin Grammys and Cable Ace Awards.